The ADF’s powers to search, seize and control movement at the scene of an incident will be simplified, expanded and made clearer. Australia’s military forces will be given power to play a bigger part in dealing with terrorist incidents, under legislation to be introduced into parliament on Thursday. The bill makes it easier for states and territories to seek help from the Australian Defence Force (ADF) to respond to terrorist and other violent occurrences, especially those that stretch the capabilities of state forces. The move was announced by the Prime Minister Malcolm Turnbull in July last year. The ADF’s powers to search, seize and control movement at the scene of an incident will be simplified, expanded and made clearer. It will also have greater ability to respond to incidents that span more than one jurisdiction. It will be able to be “pre-authorised” to protect Commonwealth interests and the state and territories from land and maritime threats, in addition to aviation threats. At present the contingent call out is limited to aviation threats. The changes also add the minister for home affairs to the existing list of those ministers who can have a role in authorising a call out of the ADF in certain circumstances. The prime minister, attorney-general and defence minister have key roles as authorising ministers. But where the prime minister and one of the attorney-general or defence minister is not available, the remaining minister can authorise a call out jointly with the deputy prime minister, foreign minister, treasurer, or home affairs minister. The enhanced remit for the defence forces has come out of the Defence Counter-Terrorism Review. While the government emphasises that the police remain “the best first response to terrorists and other incidents”, Attorney-General Christian Porter said “amendments to the ADF call-out powers are the most significant changes since the provisions were enacted in 2000” before the Sydney Olympics. The “terror threat we face today is greater and more complex than that we faced when these laws were introduced almost 20 years ago”, he said. 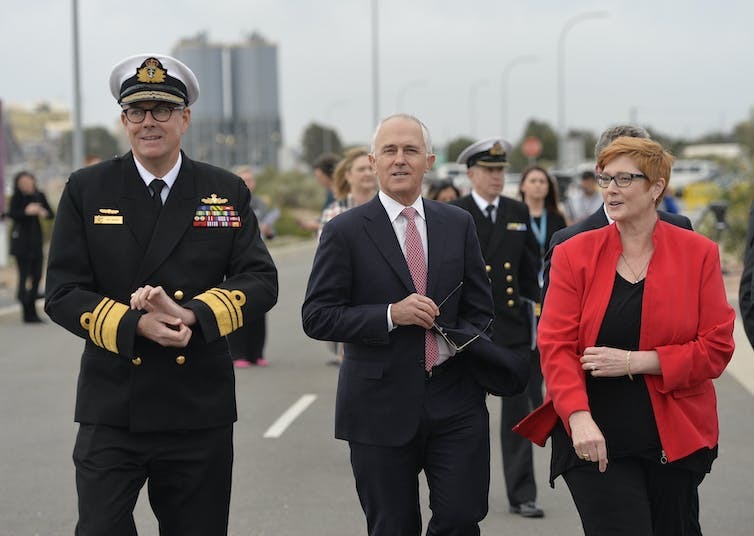 Defence minister Marise Payne said Defence had already strengthened the practical support it provided to police, including a broadened program of specialist training and better access to Defence facilities such a rifle ranges. The latest anti-terrorism legislation comes as, on a different national security front, the Senate is set on Thursday to pass the government’s measures to combat foreign interference, including setting up a register of agents of “foreign principals”. The measures have bipartisan support after the parliamentary joint committee on intelligence and security agreed on a range of amendments that have narrowed provisions and inserted protections for bodies such as charities. Whether the register will capture Chinese non-state companies remains unclear. Asked about the potential application of the register to Huawei, the chairman of Huawei Australia, John Lord, appearing at the National Press Club on Wednesday, said he didn’t see why he should register “because Huawei’s privately owned, does not have government links other than it’s Chinese. And, therefore, I don’t see why I should. Lord argued Huawei’s case to be allowed to build the 5G network, amid strong speculation that will be banned from doing so on national security grounds. He said the 5G decision was not just a tough political one but “this is a long term technology decision that could impact our growth and productivity for generations to come”. “The suggestions that Huawei, the largest provider of 4G technology in Australia today, should be banned from building 5G networks here should be a concern for everyone and every business in Australia. “The implications about limiting access to technology competition will be devastatingly high – and is a short term small mind choice rather than seeking to incorporate all technologies in a solution that also secures our critical structures”. Even after the recent arrests and deaths of dozens of its members, the Islamic State-linked network of militant groups in Indonesia organised under the umbrella Jemaah Ansharut Daulah (JAD) clearly remains a potent force. In the past week, five bombings have rocked the island of Java, killing at least 26 people and injuring more than 50 – the deadliest series of terrorist attacks in the country since the Bali bombings in 2002. These attacks included the bombings of three churches in the city of Surabaya, carried out by a family that used its children as suicide bombers. The latest attack came on Wednesday when four assailants wielding swords stormed a police station in Sumatra. One officer was killed and two others were injured. The alleged militants were shot dead. Formed in 2015, JAD achieved notoriety in January 2016 with a military-style attack in the centre of Jakarta that resulted in the deaths of four people and four attackers. Dozens of other potential attacks were foiled in the two years that followed, but several smaller ones were carried out, directed largely against the elite Detachment 88 counter-terrorism police unit – the arch-nemesis of JAD. Formed in the wake of the 2002 Bali bombings, with assistance from the Australian Federal Police, Detachment 88 has emerged as one of the world’s most effective counter-terrorism units, having arrested more than 1,000 militants. Last year, 172 suspected terrorists were apprehended and 16 shot dead, following 163 arrests in 2016 and 73 in 2015. Most of the militants recently arrested have been linked with JAD and the related Islamic State support network of Mujahidin Indonesian Timur (MIT). Since it declared its caliphate in Syria and Iraq in 2014, the Islamic State has perversely given special attention to planning and inspiring terrorist attacks during the Muslim fasting month of Ramadan, which began this week. This is the first Ramadan since the group lost control of large swathes of its territory centred around Raqqa in Syria and Mosul in Iraq. As the Islamic State is clearly desperate to maintain its brand and prove its continuing potency around the globe, there are now concerns the recent attacks in Indonesia are a sign the group has extended its reach eastward to the world’s largest Muslim-majority nation. Ever since the Islamic State shot to prominence with the fall of Mosul in 2014, there have been fears about its potential to reenergise the decades-old jihadi network in Indonesia. Indonesian police estimate 400-500 of these fighters subsequently returned home, either from Syria and Iraq, or from Turkey on their way to join the conflict. Many have been met at the airport by authorities and taken into rehabilitation programs. But others returned unannounced. With a lack of appropriate laws in Indonesia, these returning fighters cannot be prosecuted for travelling overseas to join the Islamic State. After the recent JAD attacks in Indonesia, local police have spoken of sleeper cells of returnees from the Middle East and their associates, who lay low and give the appearance of having no inclination to violence, even while they prepare for an attack at an opportune time. Initially, it was reported by the respected head of the Indonesian police, General Tito Karnavian, that a family of six involved in the bomb attacks on the churches in Surabaya had returned from the Middle East. Later reports suggested this was not the case. Nevertheless, they and the other two families involved in the attacks were close associates of Islamic State returning fighters. The world rejoiced when Raqqa, the de facto capital of the Islamic State caliphate, was finally liberated in October 2017, following a four-month siege. With the fall of the city, the last holdout of its tens of thousands of local and foreign fighters was also defeated. Months earlier, Mosul, the last city held by the Islamic State in Iraq, fell after nine months of the most brutal urban warfare since the second world war. With the caliphate destroyed, it was believed the Islamic State itself had been eliminated, too. As it turns out, the fall of Raqqa did not see the final destruction of the Islamic State army. Rather, under a secret deal brokered by the Kurdish-led, and American-backed, Syrian Democratic Forces who led the campaign to liberate Raqqa, thousands of Islamic State fighters and their families were allowed to leave the city in convoys of busses and trucks. Many made their way to Turkey, where it seems some remain. But thousands more drove into the desert of eastern Syria, occupying territory along the Euphrates River and linked to others across the border in rural northern Iraq. Many Islamic State fighters, especially local Arabs, have gone to ground, blending into villages and Sunni desert communities. Even in liberated Mosul, which is largely Sunni, many locals still express support for the militant group. The election of a Shia-dominated government in Baghdad and the failure to rebuild Mosul and other destroyed Sunni cities, mean that in Iraq, as in Syria, all the social and communal grievances that supported the emergence of al-Qaeda in Iraq (AQI) and the Islamic State of Iraq (ISI) remain in place. Even as the Islamic State was losing territory in Iraq in recent years, its leaders spoke with the conviction of an apocalyptic cult, confidently asserting that even if they lost the caliphate, the insurgency would rebuild. Today, the group has active affiliates and supporters across the Muslim world, including in the southern Philippines, and a “virtual insurgency” throughout the many Western countries that contributed around one-quarter of the group’s total of 40,000 foreign fighters in Iraq and Syria. The insurgency is far from over, and in Indonesia it may well be that the worst is yet to come. The challenge for legislators, courts and the wider community is to ensure any interference with privacy is minimal, rather than merely lawful. This article is the second in a five-part series exploring Australian national security in the digital age. Read part one here. Contrary to doomsaying by pundits or empire-building by politicians and the surveillance-industrial complex, the so-called War on Terror doesn’t mean we should – or must – kiss goodbye to our privacy. It also doesn’t mean we can forget the accountability of governments, officials and service providers. Nor does it mean we should abdicate responsibility for our own actions. In thinking about terror and other aspects of national security, we need to consider how increased citizen surveillance affects our trust in government institutions and their private sector proxies. Respect for privacy – essentially freedom from inappropriate interference – is what differentiates liberal democratic states from totalitarian states and terrorist groups. That respect is a fundamental value. It requires trust by ordinary people and officials alike that government and their proxies will abide by the law, remain accountable and not mistake what is expedient for what is necessary. That trust has been eroded in recent years by the national security philosophy endorsed by both Labor and the Coalition. National security policymakers and operatives, along with many privacy analysts, have a bleak view of the world. We recognise that Australia spies on friendly and unfriendly countries alike. They spy on us. That’s a function of being a state. Non-state groups also seek to harm or gain advantages – that’s not new. The challenge for legislators, courts and the wider community is to look outside that bunker and ensure any interference with privacy is minimal, rather than merely lawful. At the moment, we are not doing well. It is unsurprising that law-abiding people are emulating Malcolm Turnbull by embracing privacy tools such as Wickr and Snapchat. Lawmaking in Australia over the past two decades has involved a step by step erosion of privacy. The scale of that erosion has not been acknowledged by bodies such as the Office of the Australian Information Commissioner (OAIC), which consistently fails to rebuke bureaucratic opportunism. The former Victorian Privacy Commissioner notably stood up to the premier and officials in his state, which is what we would expect from a privacy watchdog. Sadly, his willingness to speak truth to power was exceptional. Protection against invasions of privacy has been progressively weakened in the name of “national security”. This can be seen in the removal of restrictions on the sharing of information by agencies, pervasive biometrics such as the government’s new facial recognition system and mandatory retention of telecommunications metadata. We see the militarised Home Affairs Department seeking to co-opt ASD – our most important spy agency – for warrantless access to the electronic communications of every Australian, rather than just ‘hostiles’ overseas. Ongoing erosion cannot be justified. It has been persistently criticised by conservative bodies such as the Law Council of Australia and civil advocates such as the Australian Privacy Foundation. Privacy is not contrary to national security. It is a matter of balance, rather than an absolute. Australian law (like that in the UK) has always allowed data collection, potentially on a mandatory basis – such as the Census. The law has always allowed overt or covert surveillance by officials, such as the undisclosed opening of mail or recording of conversations. But such invasions must not be arbitrary. They must be restricted to those rare circumstances where disregard of privacy is imperative, rather than merely convenient. They must take place within a framework where there is some independent oversight to prevent abuse. Oversight fosters trust. Such oversight might, in the first instance, consist of the requirement for a warrant, given our trust that courts will not rubber-stamp official abuses. It might involve systemic oversight by specialist bodies such as the Independent National Security Legislation Monitor (INSLM). Australia does not have a discrete Bill of Rights under the national Constitution, although there have been cogent proposals from experts such as Bede Harris. Privacy law is incoherent, with significant variation across states, territories and Commonwealth, and major holes in data privacy. Some states do not have a discrete Privacy Act, an absence that would be understandable in 1850, but is disquieting in 2018. As a society, we expect officials will always do the right thing. Trust is fostered by laws that are necessary, transparent and properly implemented (for example, through the independent oversight noted above). In thinking about these social objectives – more than just “winning” a conflict that may last across generations – we need to ask some hard questions about public and private responsibility. The first question we must ask, as citizens, is whether privacy – and law – is something that should always be sacrificed when there is a perceived threat to national security. We should acknowledge that not all threats are equally serious. We need informed public discussion about the need for and appropriateness of governments restricting use of private encryption tools and requiring that service providers offer law enforcement officials secret back doors into private communications. Another question is whether officials should access private communications simply by asking service providers, without the discipline provided by a warrant. Can we tell if there have been abuses of our privacy? Watchdogs such as the OAIC and the INSLM need stronger protection from political pressure) and more resources, on the basis that an underfed and frightened watchdog is ineffective. What’s more, we need to question to what extent we should trust governments and officials that are hostile to public disclosure. This hostility is exemplified by the Commonwealth Public Service Commissioner’s characterisation of FOI as “very pernicious” and the two years the OAIC spent in budgetary limbo, following efforts by the Abbott government to shut it down. There are times when it is in everyone’s interests not to share secrets. That isn’t always the case, and we must ensure our governments, which exist to serve us, are accountable. The Defence Act will be strengthened to enable defence personnel to play a bigger role in counter-terrorism. The Australian Defence Force (ADF) is to be given a bigger role and greater powers in combating terrorism, under changes announced by the government on Monday. The measures – including specialised training by special forces for law enforcement teams – will provide more Commonwealth support to state police forces, which are still acknowledged as the appropriate “first responders”. The changes are designed to assist in preparing for incidents, enabling a more comprehensive ADF response if needed, and improving the flow of information between the ADF and police during an incident. Defence will offer to place officers within state law enforcement agencies to help with liaison and engagement. This will assist with “pre-positioning” defence personnel in response to a possible incident. The Defence Act will be strengthened to remove some constraints governing the “call-out” of the ADF in terrorist situations. This includes removing the current limit on states and territories asking for defence force support and specialist military skills until their capability or capacity has been exceeded. The government will also strengthen the act to make it easier for Defence personnel to support the police response, such as clarifying their power to “stop and seize” suspects to prevent them leaving the scene of an incident. “These measures will improve the nation’s ability to respond to terrorism as well as improve the effectiveness of Defence’s contribution to domestic counter-terrorism arrangements,” Turnbull and Payne said. The changes would be made in partnership with state and territory governments, they said. The government initiated the review of Defence’s support to the national counter-terrorism effort last year in response to the changing nature of the terrorist threat, as shown by attacks overseas. It is the first time the ADF’s domestic contribution has been reviewed since 2005. The package addresses some of the coroner’s recommendations in the report on the 2014 Lindt cafe siege, in which two victims and the attacker, Man Haron Monis, died. That incident produced calls for a bigger role for the military. Turnbull and Payne stressed that responses to the terrorism threat must be constantly updated. The government is currently considering whether there should be a consolidation of the security agencies under a home-office-type ministry that would be headed by Immigration Minister Peter Dutton. There are sharply divided views within government about going down such a route. Later this week, a version of the review of the Australian intelligence community done by former officials Michael L’Estrange and Stephen Merchant will be released. USA Foreign Policy Failure in Afghanistan and Iraq?